December 10th was a busy day for the BET, video countdown show, 106th and Park. Omarion and Bow Wow were in-the house promoting their duo album "Face Off" (due out today), Gabrielle Union and Morris Chestnut were in the studio promoting their new movie "The Perfect Holiday" to be released on Dec 12th. Essence Atkins (Gabby's number 1 partner in crime), wore an effortless chic style as always, that woman is a true simple style fashionista. For the Rocsi, revamp I would have styled her with the shirt dress tucked in or belted with this faux croc belt from Banana Republic near the waist area. 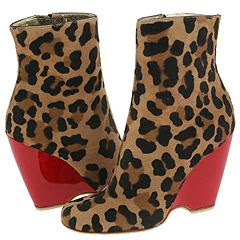 Then we would have worked the Giuseppe Zanotti wedge boot instead of the low-cut wedge.